If you have to limit yourself to one anime movie series in your life, or in the next week, Evangelion is one of your best options. The infamously complex post-apocalyptic anime series was rebooted in two incredible films, Evangelion 1.0: You Are (Not) Alone and Evangelion 2.0: You Can (Not) Advance, released over the past few years. And now we've got our first news about the next two movies in the series. 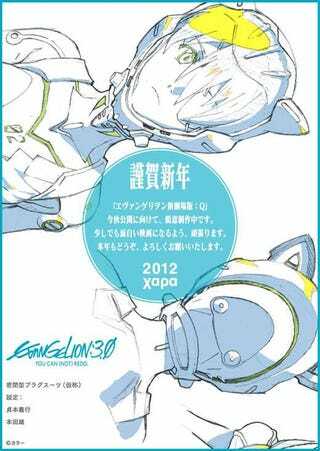 This fall, we'll get Evangelion: 3.0 You Can (Not) Redo. No word on the plot yet, but I'm sure we can expect more embarrassing shenanigans between the teens who control the giant mobile armor Evangelion units, and some epic battles against the deadly, abstract Angels. Plus, more mad scientist dad backstory, revealing more about humanity's high tech battle against Angels who destroyed the world. Evangelion 4.0, the final movie, doesn't have a name yet, but it does have a mysterious website. It's also slated for 2013, so we won't have long to wait to reach the end of this mind-warping, post-human epic.